The Hellas Montes are a group of mountains along the western rim of the giant Hellas Basin on Mars. The Hellas Basin is the largest of the obvious impact craters on the Red Planet. It is very ancient and has been partially filled by sediments. The Hellas Montes are part of the eroded crater rim. 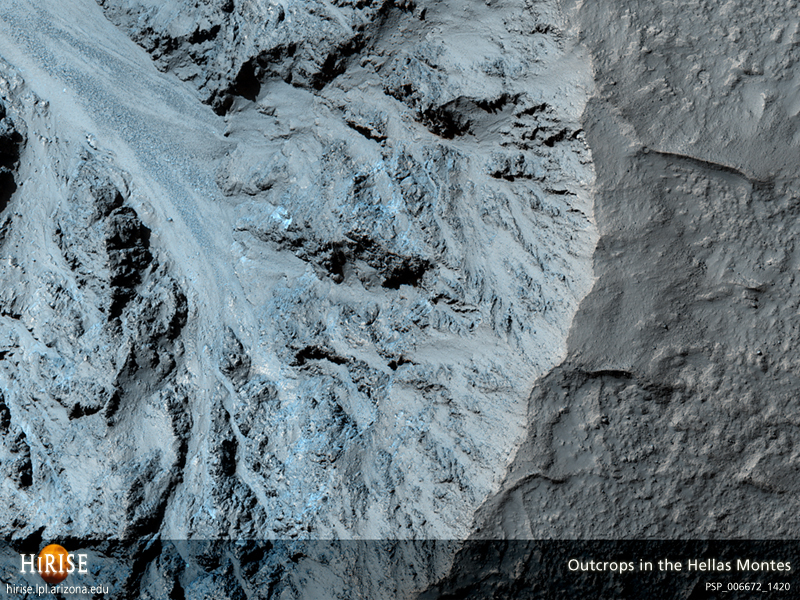 In the central part of this HiRISE image, we can see steep slopes where landslides have exposed a variety of rocks. The jumble of blocks, rather than stacks of layered sediments or lavas, is consistent with impact crater ejecta. On flatter slopes, the ground is covered with a mantling deposit that is generally considered to be ice-rich dust. In the southern part of the image, a large circular depression—rimmed by a zone with many large boulders—is visible. This is an impact crater with a relatively thin mantling deposit on its rim. This is a stereo pair with ESP_031910_1420.